Induction coil design has a major impact on process efficiency and final part quality, and the best coil design for your product largely depends on your application. Certain coil designs tend to work best with specific applications, and a less than optimal coil-application pairing can result in slow or irregular heating, higher defect rates, and lower quality products. 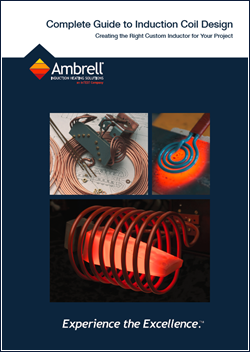 We're pleased to release our new eBook, the 28-page "Complete Guide to Induction Coil Design." Induction coil design can have a major impact on part quality, process efficiency, and manufacturing costs. This helpful eBook provides virtually everything you need to design the optimal coil for your part and process. The induction work coil, also known as the inductor, is the component in an induction heating system that defines how effectively and efficiently the work piece is heated. A current flowing in a conductor creates a magnetic field. An alternating current creates an alternating field which produces an alternating current in a second conductor (your part or work piece).